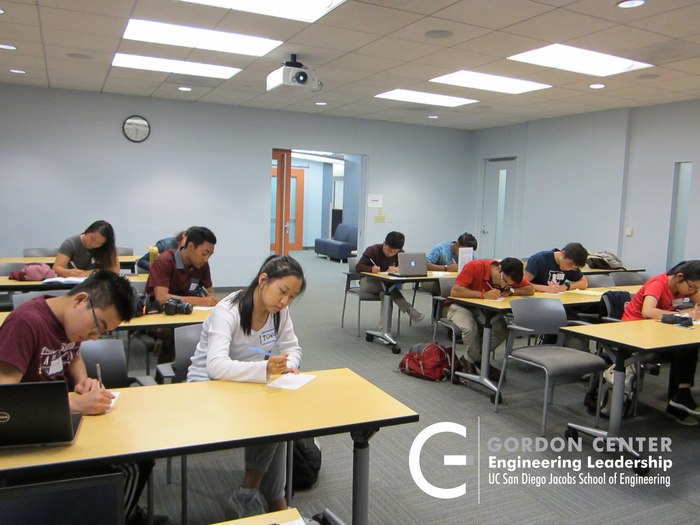 In its eighth year of operation, the Gordon Center at the Jacobs School of Engineering has extended its reach and impact on students and working professionals through a series of interactive trainings on values and team formation. The Gordon Center, which educates and trains effective engineering students and professionals, has expanded its team development trainings to BMES (Biomedical Engineering Society), Envision Maker Studio interns, Global Ties, NSF I-Corps and the Osaka University International group (Von Liebig Center) at the Jacobs School of Engineering. The active outreach and trainings with other organizations this fall quarter has resulted in a higher demand from students and professionals to take more leadership development workshops. Indeed, this quarter has proven to be very productive for students, professionals and the center promoting the advocacy for more leadership training. These outreach efforts have succeeded because of the responsive student participation and the positive feedback from other engineering organizations. Through the continual leadership team development trainings and outreach to organizations, we have been able to see the growth of individuals and watch them realize their potential. The Gordon Center hopes to continue its outreach to other organizations in 2017 and expand its student outreach. If you would like more information, please email us at GordonCenter@ucsd.edu. The VOICE seminar, led by Dr. Victoria Cajipe and guest Greg Einhorn. On November 5, the von Liebig Entrepreneurism Center and the Office of Innovation and Commercialization collaborated to present a VOICE seminar on Provisional Patents. The room was filled with undergrads, grads, and Postdocs alike, all looking for information on how to make their ideas a reality. Victoria Cajipe, PhD, Senior Licensing Officer of the OIC, led the presentation, explaining the patent processes for UC San Diego inventors and entrepreneurs. 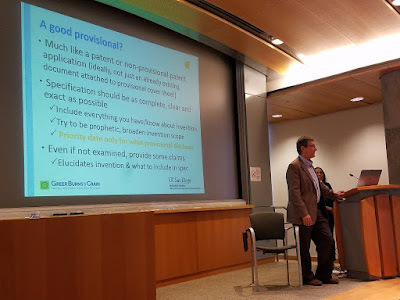 Greg Einhorn, from Greer Burns & Crain, a firm that works with people looking to develop patents and license their products, was there to present alongside OIC, and helped to outline the long process from idea-making to patenting. Another important topic of the seminar was the Innovation and Commercialization Loop, a feedback loop that helps streamline the idea inventing process all the way up until commercialization, through both licensing and patenting. The loop serves as an ideal outline for inventors looking to not only make their product, but also to commercialize their product to the rest of the world. Cajipe also listed out the varying types of patents. Utility patents and provisional apps are all slightly different and have individualized processes, and Einhorn advised that attorneys and agencies should be utilized during the formal patenting process, despite it being quite a steep investment. Through UC San Diego’s commercialization program, all students are eligible to consult with the OIC to try and get their ideas patented. Cajipe explained that the OIC will help finish the technical commercialization processes for the student as well as taking care of all fees for patenting; the student, in exchange, will receive 35% of potential profits from the licensed product. UC San Diego prides itself on being a technologically advanced university, with numerous new patents each year being attributed to the university. Of course, none of this could be achieved without the students' brilliant minds and trailblazing creativity. Dr. Alex Zaretski, UCSD alum and founder of GrollTex. On November 3, the von Liebig Entrepreneurism Center and the Mechanical and Aerospace Engineering department hosted a Ph.D alternative career path seminar featuring von Liebig alum Dr. Aliksandr (Alex) Zaretski, founder of GrollTex. Dr. Zaretski, whose company helps to develop “graphene rolling technology”, talked about his journey from starting out as a doctoral student to gathering the courage to co-found a startup. It was his fascination of graphene and its variety of uses that led to his pursuit of his PhD in Nanoengineering at UC San Diego. 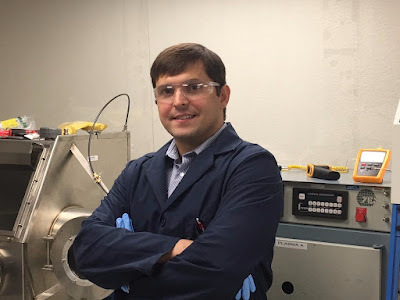 At first, he thought academia was his future, but his passion for graphene’s exciting new tech potential directed him to pursue the entrepreneurial route. Eventually, he developed an innovative process to produce high quality “sheets” of graphene at a very low cost, without any toxic residues. Rather than write papers on the process, he wanted to explore the seemingly endless possibilities of this advanced material. With this, he co-founded a spin-off company called GrollTex, which holds exclusive rights on a portfolio of patents issued by UC San Diego. Dr. Zaretski stressed that it takes an immense amount of work and determination to start a company -- and that there are a lot of risks in embracing the unknown. However, being able to have a say on the future of the technology and directly shaping its direction was worth the risk to him. A piece of advice he had for students was not to wait until graduation. “If you have good ideas, start as soon as you can,” he said. Dr. Zaretski acknowledged the von Liebig Center’s programs for helping him develop the savviness to become a successful entrepreneur, and pointing him towards resources like competitions and essential team members that would help him in starting a company. He noted that while it is important to be fluent in tech skills, having business savvy is also just as important so investors may take you seriously and believe in your product. Grolltex is one of the von Liebig Center’s up and coming startups to watch. With initial investment funding raised, and all the needed manufacturing and testing equipment in place, GrollTex is hoping to start filling orders in 2017. Winners Camila Hernandez (left) and Camila Gratacos (right) of Team Bionurse. The BioNurse team from the Ceres Regional Center for Fruit and Vegetable Innovation in Chile won the first ever Ray C. Anderson Foundation Ray of Hope Prize, a $100,000 award that will allow them to introduce their soil restoration project to the marketplace. Gratacos and her partner, Camila Hernandez, competed fiercely in the 2015 Biomimicry Global Design Challenge. The Biomimicry Institute is a non-profit organization that encourages the development of nature-inspired solutions for a healthy planet. 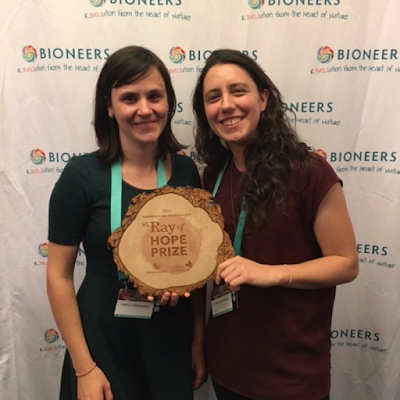 All seven teams vying for the prize met at the Bioneers Conference in San Rafael, California last month on October 22 to pitch to judges. During the year-long Biomimicry Accelerator program, these seven teams developed their design concepts and market strategy. As a Biomimicry Institute partner, the von Liebig Center provided online training and mentoring to these seven teams from Chile, Thailand, El Salvador, Italy, Germany, Slovakia and the US. The Biomimicry Institute, the Ray C. Anderson Foundation, and the von Liebig Entrepreneurship Center congratulate all of the teams who competed for the first-ever $100,000 Ray of Hope Prize. It is now only a matter of time before prototypes make their way to market soon. All seven teams that competed for the $100,000 Ray C. Anderson Foundation Ray of Hope Prize were originally selected as finalists in the 2015 Biomimicry Global Design Challenge. The teams that participated in the intensive year-long Business Accelerator Program were trained on how to take their social innovations to market. The von Liebig Center within the Institute of the Global Entrepreneur provided an online course taught by Mr. Jonathan Masters on customer development, commercialization, finance, and marketing. Four mentors from the von Liebig Center worked with the seven teams in online webinars to bring their design concepts to reality. BioNurse and Oasis Aquaponics worked with Dr. Rosibel Ochoa. Jube and BioCultivator worked with Dr. Rob Logan. Living Filtration worked with Dr. Albert Liu. Hexapro and Mangrove Still worked with Mr. Jonathan Masters. The BioNurse team created the BioPatch, a biomimicry solution that enhances soil’s capacity to retain water, nutrients, and microorganisms. This invention ensures that degraded land is restored for the next generation of crops. All seven Accelerator teams earned tremendous praise from the Ray of Hope Prize judges. They complimented the Oasis Aquaponic System’s potential for impact in the developing world, the Jube’s brilliant combination of function and beauty, the BIOcultivator’s elegant design, the Mangrove Still’s innovative business model, the Living Filtration System’s clever agricultural transition strategy, and Hexagro’s successful integration of a physical technology with a broader social network strategy. Because of the high quality of all of the teams’ designs, trustees decided to award an added bonus to this year’s program. The trustees of the Ray C. Anderson Foundation awarded $20,000 to the Oasis Aquaponic System, $15,000 to the Jube team, and $10,000 each to the four other finalist teams, for a grand total of $175,000 in award money. It's no surprise that the theme of this quarter's Mechanical and Aerospace Engineering 3 (MAE3) robot competition was Pokemon Go - students were charged with building robots that could loft balls into a laser-cut Pokestop for points. Team W.H.O. beat out more than 40 other teams to get to the semi-finals with their unique design. The team, consisting of second year physics major John-Paul Pascual, second year political science major Alex Velazquez, second year aerospace major Goutham Marimuthu and third year mechanical engineering major Kevin Tsao, used sheet metal to create a wall that traveled along a rail and prevented the other team's robot from accessing the balls. When one team went around the wall, team W.H.O. simply moved their robot forward and dropped the sheet metal which opened like a pair of wings to prevent the other team's robot from depositing the balls at the Pokestop. Check out their website for more on the design! Team W.H.O. lost in the semifinals to another team with that used a blocking mechanism - one that prevented their own from working. "We had a lot of diversity in the robots this year," said MAE3 instructor Nate Delson. "I'm proud of all of our students and mentors." Mentors and winning teams were provided with custom, 3D-printed trophies. Also unique to the competition this year were the controllers, designed and fabricated by summer interns in the EnVision Arts and Engineering Maker Studio, with the help of the MAE Department. Engineering World Health hosted its second annual Gingerbread House Building Competition on Sun. Dec. 4. Three teams were challenged to create the best house in under 25 minutes given the following point categories: Tallest Gingerbread House; Holidays Feels; Overall Aesthetic and Creativity; and Santa Sleigh Ride Test, a shake table test. This team had the tallest gingerbread house, though it fell apart during the Santa Sleigh Ride Test. From left to right, the group included junior Christopher Yin, senior Pranav Singh, junior Alan Loi and sophomore Harleen Singh. This team tied for first place, scoring best in overall aesthetic and creativity. From left to right, the team included freshman Hannah Peterson, junior YiDing Fang, freshman Justin Burger, junior Bryce Killingsworth, freshman Sheela Thoreson and sophomore Ella Stimson. This team tied for first place and had the highest score for Holiday Feels with their evergreen tree, fit with presents and broken candy canes around the perimeter. From left to right, the group consisted of sophomore Elijah Garcia, sophomore Sienna Schmolesky, senior Yajur Maker and second-year transfer Geovanni Alarcon. It’s no secret that UC San Diego’s reputation as a top-ranked university is a major draw for prospective students—but it’s also pulling many graduates back to campus to serve as members of the faculty. In classrooms and labs across the university, our alumni are leading new directions in research and helping to train the next generation of innovators. Olivia Graeve is a professor of mechanical engineering at the Jacobs School of Engineering and a proud native of the San Diego-Tijuana region. She grew up in Tijuana and attended Southwestern Community College before transferring to UC San Diego to study structural engineering. 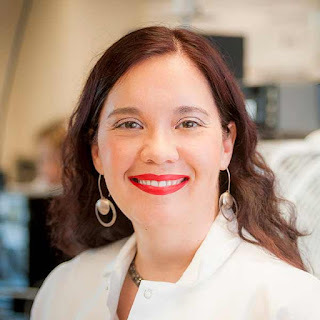 As an undergraduate, she worked in the lab of Professor Joanna McKittrick and saw first-hand what it takes to run a research laboratory. “The experience put me on an excellent path toward the professoriate,” she said. Graeve is working on developing materials that can withstand extreme impacts and are faster and more cost-effective to manufacture. Earlier this year, her lab developed a record-breaking steel alloy—a material that could be used for everything from drill bits, to body armor for soldiers, to meteor-resistant casing for satellites. Graeve held faculty positions at the University of Nevada, Reno and Alfred University in New York before joining the UC San Diego faculty. Reflecting on how the campus has changed since she was a student, Graeve says that UC San Diego is bigger and better, with more opportunities for students, staff and faculty. Today, she’s doing her part to ensure the university continues on its upward trajectory. Graeve leads a number of outreach programs for underrepresented students on both sides of the border. She also serves as director of the CaliBaja Center for Resilient Materials and Systems, which brings together researchers across the San Diego-Tijuana region. Do you ever find yourself hitting the snooze button over and over, and then wishing you could fly or had roller skates for feet so you could make it to class on time? James Yao, a first year Visual Arts major, solved this problem by building an electric bike. Yao came to UC San Diego to build his bike. When Yao arrived at UC San Diego, he asked his orientation leader about resources for makers on campus and heard about EnVision. When he saw the photos of the space on the website, he knew he could finish the project. Yao used the 3D printers to prototype brackets for mounting his electric motor and the soldering stations to build the electronics. Yao’s bike goes up to 25 mph, which helps him get from Warren to his 8:00 a.m. class on the other side of Peterson Hill! Jealous? Who knows, maybe he’ll help you build one! UC San Diego master's student Mansi Malik received a grant from the Center for Networked Systems to attend the premier conference for women in computing. Thanks to the Center for Networked Systems (CNS) at the University of California San Diego, Mansi Malik was able to attend what has become the premier conference for women in computer science (and for many men too). 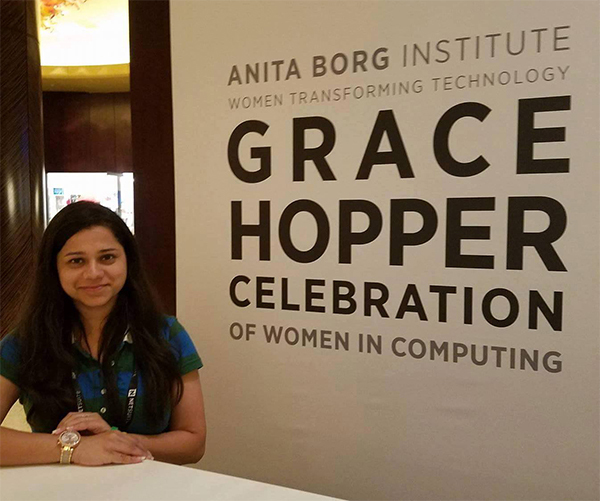 The second-year graduate student in Computer Science at UC San Diego was among the 35 UC San Diego students (including nine grad students) and 15,000 people overall attending the 2016 Grace Hopper Celebration of Women in Computing October 19-21 in Houston, TX. “It was really cool and exciting to see and meet so many women in computer science from all over,” says Malik, who expects to complete her M.S. degree in 2017. “A lot of great energy and excitement was going around, and there were inspiring talks by awesome speakers.” Malik says she was particularly inspired by the keynote speakers, including Latanya Sweeney, founder of Harvard’s Data Privacy Lab, IBM CEO Ginni Rometty, and Megan Smith, who was appointed Chief Technology Officer of the United States in 2014 by President Obama, from her previous position as a vice president of Google[x], Google’s advanced products unit. Malik was also impressed with the keynote by Salesforce CEO Marc Benioff. Members and officers of Graduate Women in Computing (GradWIC) chapter at UC San Diego were among 15,000 people attending the Grace Hopper Celebration of Women in Computing 2016. Overall, she says, the conference was a valuable experience. “There were great networking opportunities through the career fair and company-sponsored events and lunches,” explains Malik, who is the Undergrad WIC Coordinator and publicity manager for GradWIC this year. “I also talked to a lot of recruiters and engineers from tech companies about GradWIC and built some industry connections for us so that we can host more events.” She also appreciated a session on negotiating salaries, in which she learned that for every four men who dare to negotiate for a better starting salary, only one woman will attempt to negotiate – and the problem spills over into other areas because many women are unaware that they can negotiate for more than just salary. 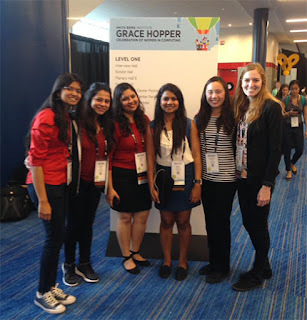 Many of the previous recipients of CNS travel grants to Grace Hopper Celebrations, like Mansi, were also officers in GradWIC, including former VP Neha Chachra (who attended the event in 2011), Publicity Manager Karyn Benson (2013), and GradWIC Secretary Malveeka Tewari (2014). Mansi recently attended her first GradWIC general business meeting as an officer on Oct. 25, and says the group will host a faculty lunch event the week of Nov. 14 (see Facebook page for details). The previous winner, Vicky Papavasileiou, in 2015 was the first ECE graduate student to win the CNS award, and she was only the second M.S. student to receive the travel grant (the first was Shikha Jain in 2012). For a full list of past recipients, visit the travel grant page on the CNS website. Malik enrolled in CSE’s M.S. program in 2015 and also became a teaching assistant. This past summer, she did a software development internship at Mitchell International in San Diego, where she worked on a system for commenting into Visual Studio (eliminating the need to switch between Visual Studio and Microsoft Outlook during daily code reviews). Prior to arriving in San Diego, Malik completed her undergraduate degree in computer science with honors at Kurukshetra University in the North Indian state of Haryana. The Grace Hopper Celebration of Women in Computing is presented by the Anita Borg Institute for Women in Technology and the Association for Computing Machinery (ACM).